Wire rope consists of three basic components; while few in number, these vary in both complexity and configuration so as to produce ropes for specific purposes or characteristics. The three basic components of a standard wire rope design are: 1) wires that form the strand, 2) multi-wire strands laid helically around a core, and 3) the core (Fig. 1). Wire, for rope, is made in several materials and types; these include steel, iron, stainless steel, monel, and bronze. By far, the most widely used material is high-carbon steel. This is available in a variety of grades each of which has properties related to the basic curve for steel rope wire. Wire rope manufacturers select the wire type that is most appropriate for requirements of the finished product. Grades of wire rope are referred to as traction steel (TS), mild plow steel (MPS), plow steel (PS), improved plow steel (IPS), extra improved plow steel (EIPS), and extra extra improved plow steel (EEIPS). (These steel grade names originated at the earliest stages of wire rope development and have been retained as references to the strength of a particular size and grade of rope.) The plow steel strength curve forms the basis for calculating the strength of all steel rope wires; the tensile strength (psi) of any steel wire grade is not constant, it varies with the diameter and is highest in the smallest wires. The most common finish for steel wire is “bright” or uncoated. Steel wires may also be galvanized, i.e. zinc coated. “Drawn galvanized” wire has the same strength as bright wire, but wire “galvanized at finished size” is usually 10% lower in strength. In certain applications, “tinned” wire is used, but it should be noted that tin provides no sacrificial, i.e. cathodic, protection for the steel as does zinc. For other applications, different coatings are available. “Iron” type wire is actually drawn from low-carbon steel and has a fairly limited use except in older elevator installations. When, however, iron is used for other than elevator applications, it is most often galvanized. Stainless steel ropes, listed in order of frequency of use, are made of AISI types 302/304, 316, and 305. Contrary to general belief, hard-drawn stainless Type 302/304 is magnetic. Type 316 is less magnetic, and Type 305 has a permeability low enough to qualify as non-magnetic. Monel metal wire is usually Type 400 and conforms to Federal Specification QQ-N-281. Bronze wire is usually Type A Phosphor Bronze although other bronzes are specified at times. Strands are made up of two or more wires, laid in any one of many specific geometric arrangements, or in a combination of steel wires with some other materials such as natural or synthetic fibers. It is conceivable that a strand can be made up of any number of wires, or that a rope can have any number of strands. The following section, IDENTIFICATION and CONSTRUCTION, provides a complete description of wire rope constructions. The core is the foundations of a wire rope; it is made of materials that will provide proper support for the strands under normal bending and loading conditions. Core materials include fibers (hard vegetable or synthetic) or steel. A steel core consists either of a strand or an independent wire rope. The three most commonly used core designations are: fiber core (FC), independent wire rope core (IWRC), and wire strand core (WSC) (Fig. 2). Catalog descriptions of the various available ropes always include these abbreviations to identify the core type. To summarize: a wire rope consists, in most cases, of three components: wires, strands, and a core (Fig. 1). To these may be added what can be considered a fourth component: the wire rope’s lubricant – a factor vital to the satisfactory performance of most operating ropes. Figure 1. 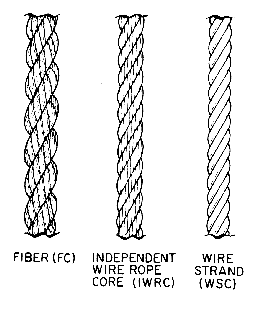 The three basic components of a typical wire rope. Figure 2. The three basic wire rope cores. In selecting the most appropriate core for a given application, a wire rope manufacturer should be called upon for guidance. The core is the foundation of a wire rope. If the core cannot support the compressive load imposed, the rope will lose its clearance between strands and its service life will be shortened. Steel cores (WSC or IWRC) should be used when there is any evidence that a fiber core will not provide adequate support. Also, if the temperature of the environment may be expected to exceed 180º (82ºC) steel cores must be used.